Artists First published in Scapegoat, 03, “Realism”. 1. Nicholas Bourriaud, Relational Aesthetics (Paris: Le Press du Reel, 1998). and architects increasingly appear to be uncomfortable about the ubiquitous power of images. In conferences, lectures, and discussions one often hears the recurring lament that images have replaced “real” things, “real” facts, “real” people, “real” experiences. While in the visual arts the turn towards performance and event took place some time ago, within architecture this has been a relatively new phenomenon. For example, in recent Biennales and other architectural exhibitions it is possible to see how installations—some being almost one-to-one architectural models and events featuring architects interacting with visitors—are replacing drawings and pictures as the primary mode of architectural representation. With the current rise of activism and participation as a new cultural trend in a time of economic crisis, what the French art curator Nicolas Bourriaud has defined as “relational aesthetics” has entered architecture. A “relational architecture” means that the latter is no longer about drawing, designing, or buildings, but about editing, curating, presenting, acting, and interacting. And yet everything ends up being an image. Even if architects dislike images and try to stage “real” events or situations, images remain the fundamental medium through which these events are transmitted. Instead of trying to go beyond images, perhaps it would be more interesting to understand them not as mere illustrations, but as a form of production. Within architecture the production of images transcends the distinction between “virtual” and “real” spaces. If architecture is not just built matter, but the embodiment of values, ideologies, and affects, then the production of images has to be understood as a substantial aspect of the production of architecture in its real form. This becomes especially true within a condition in which communication, representation, and affect are fundamental assets of contemporary political economy. Images are not just simulacra of reality, but have a material reality; they are things among things. The tradition of thought known as post-operaism has taught us to resist the postmodern distinction between the virtual and the real in favour of an understanding of reality as production, in which what exists as information and knowledge, as well as physical objects, are part of the same field of affective relationships.2. See especially Christian Marazzi, Capital and Affects (Los Angeles: Semiotext(e), 2010). It is in light of this approach to reality as a productive-affective apparatus that it is crucial to rethink the production of images and their role in presenting architecture. In the following notes I would like to put forward some reflections on the problem of making images in architecture and how these images may establish a critical relationship between their production and subjective response. The following will be articulated in two parts. First, I will summarize how images have become central to the rise and development of architecture as a discipline since the 15th century. In the second part, I will reflect on the ontological dimension of images as “pictures.” Specifically, I will refer to critical reflections on the work of the 19th-century French painter Edouard Manet, put forward by Georges Bataille, Michel Foucault, and Michael Fried, which I believe offer an engaging understanding of the production of images as material entities liberated from their role as mere simulacra of reality. Images gain importance within architecture at the moment it is distinguished from the practice of building in the 15th century. As soon as architecture is practiced as a “project,” i.e. as a projection of something that does not yet exist, the role of drawn images becomes crucial. Unlike the medieval master builder, the architect does not build but designs architecture. The word design itself is a reminder of the importance of disegno, the two-dimensional delineation of an object. The disegno of a building in plan, elevation, and perspective becomes then the fundamental object of architectural production. Such importance is amplified by the invention of printing and the diffusion of architectural treatises. If Alberti, the first modern theorist of the architectural project, wrote a treatise with no images (to avoid erroneous copies of his precepts), with the invention of printing, it was possible to mechanize the reproduction of drawings and make them available for imitation and copy. The mass production and re-production of drawings is thus at the very origin of architecture, creating a means for the effective and accurate transmission of architectural ideas. While drawings as orthogonal projections of buildings became a scientific and measurable method to direct and control the construction of architectural artefacts, perspectival views become the fundamental way to present a project in its realist form. Since the 16th century, rendering architecture through images has been a crucial tool for persuading a patron or explaining architecture to a larger audience. For this reason, architecture as painted image is an important genre parallel to the rise of non-narrative subject matters in painting such as the still life and landscape. If the most radical of modern architects rejected the artistic rendering of their schemes in favour of more objective and scientific forms of representation (think of Hannes Meyer’s use of impersonal axonometric drawing), within the postmodernism of the latter part of the 20th century the production of drawings and renderings per se became once again crucial. Critics and historians of architecture have understood the rise of “paper architecture” in the 1960s and 1970s as a utopian critique of modern urban development. What they have overlooked is how its rise was also triggered by the increasing importance of communication as a form of immaterial production in which information, knowledge, and affect play fundamental roles. Indeed, since then the reproduction of the architectural “general intellect” has occured mostly via visual material such as photographs, drawings, renderings, and diagrams. This condition is reflected by the forms of buildings themselves, which seem to be designed as three-dimensional images more suited to be experienced as reproductions than as spatial constructs. Indeed, the most celebrated architectural buildings are today known through their reproductions, especially photographs. It is possible to say that post-Fordist modes of production, in which communication plays a key role, implies an experience of architecture in which the object (architecture) and the viewer’s subjective response to it are constantly collapsed into the same entity. This is evident in architectural projects which use perspectival views to produce an empathetic relationship with their audience. Images do not simply render proposed interventions but suggest and determine ways to experience them; the representation of architecture thus becomes one with its subjective experience. It is within this context that a critical stance towards the role of images is not to refuse them, but to open a gap—a critical distance—between images and their experience. InMichael Fried, Manet’s Modernism, or, The Face of Painting in the 1860s (Chicago: University of Chicago Press, 1998), 25.
order to suggest a different understanding and use of images I would like to refer to the paintings of Edouard Manet. What characterizes Manet’s work is its ambivalence: his paintings are both realistic and abstract. They are realistic because they represent their content in the most prosaic and down-to-earth way. They are abstract because of their stubborn, inexorable flatness—they are pictures after all. 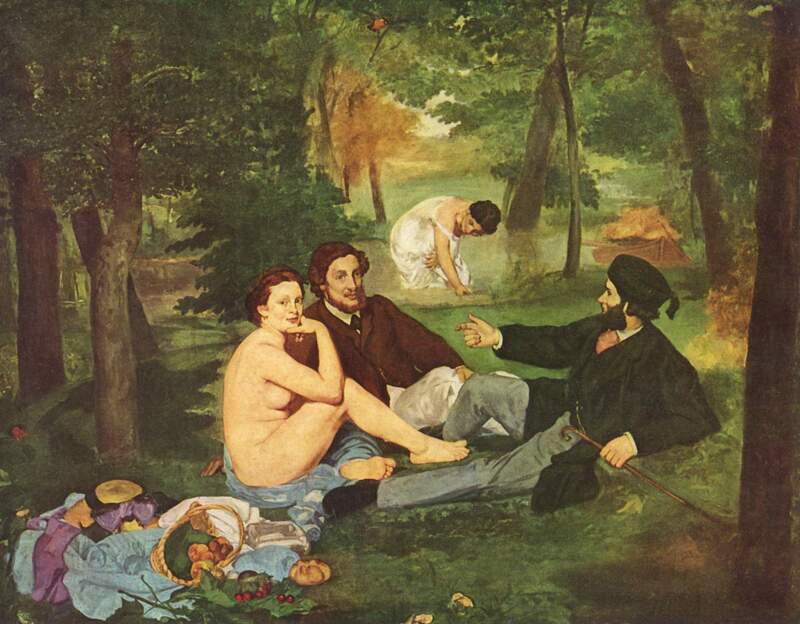 It is well known that famous paintings such Olympia and Déjeuner sur l’herbe radically challenged their first viewers. And yet, as frequently noted, this challenging aspect was not due to the particular subjects of these paintings, but to the way the pictures themselves were composed and presented. In both paintings, the main figures seem to address the beholder directly, and yet their gaze is empty, leaving the audience suspended in a paradoxical condition of both confrontation and indifference. The emptiness of expression is amplified by the composition of the paintings in which all the things depicted—people, objects, landscapes—are treated with equal importance. It is for this reason that the radicality of Manet’s pictures have become the object of three important reflections on representation: those put forward by Georges Bataille, Michel Foucault, and Michael Fried. In his studies on Manet, Bataille emphasized how, for the first time in the history of pictorial representation, Manet attacked the most important convention of images: their narrative function.4. Georges Bataille, Manet (Geneva: Skira, 1955). From Aristotle’s Poetics up to the 19th century, the role of images, and especially painted images, was to address human action; the history of visual arts was unthinkable outside of its function to narrate the history of man. But according to Bataille, Manet’s pictures do not narrate anything: the subject matter is devoid of any allegorical or historical quality. As Carole Talone-Hugon has suggested, Manet makes things visible and no longer legible.5. Carole Talon-Hugon, “Manet o lo smarrimento dello spettatore”, in Michel Foucault, La pittura di Manet, edited by Maryvonne Saison, trans. Simona Paolini (Milan: Abscondita, 2005), 75. 6. Michel Foucault, Manet and the Object of Painting (London: Tate, 2011), 15. 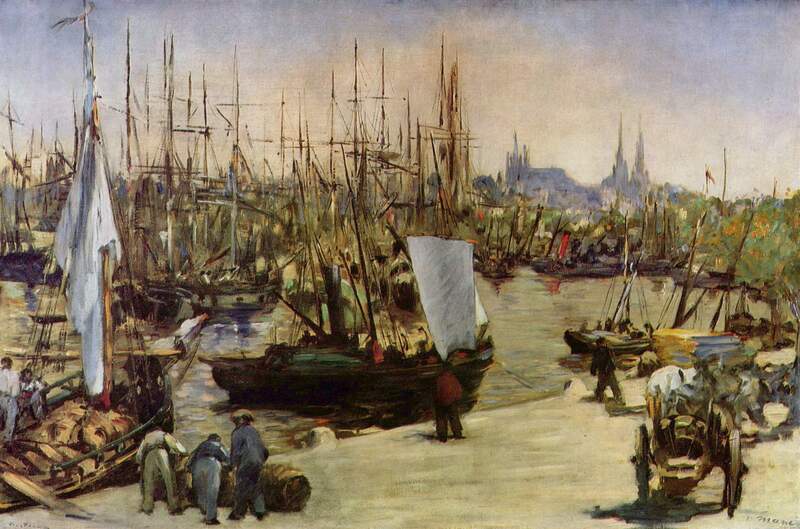 For Foucault, Manet’s pictures do not express anything but the material properties of painting itself.. For example, in a painting such as Le port de Bordeaux, Manet depicts the multitude of boats docked in the port as a pattern of vertical and horizontal lines. According to Foucault, this pattern reproduces not only the vertical and horizontal lines that delimit the surface of the painting, but also the very grain of the painting: all the vertical and horizontal fibres that constitute the canvas itself as a material object. This attitude, which anticipates abstraction without being abstract, is complemented by Manet’s radical critique of one of the most important narrative tropes of western painting: whatever situation is depicted within the frame of the painting, the thing or person around which the event unfolds is always contained by the painted scene. Foucault cites Masaccio’s famous fresco Obolo di San Pietro, in which all the figures look at the event of the miracle performed by the main protagonist of the painted scene. 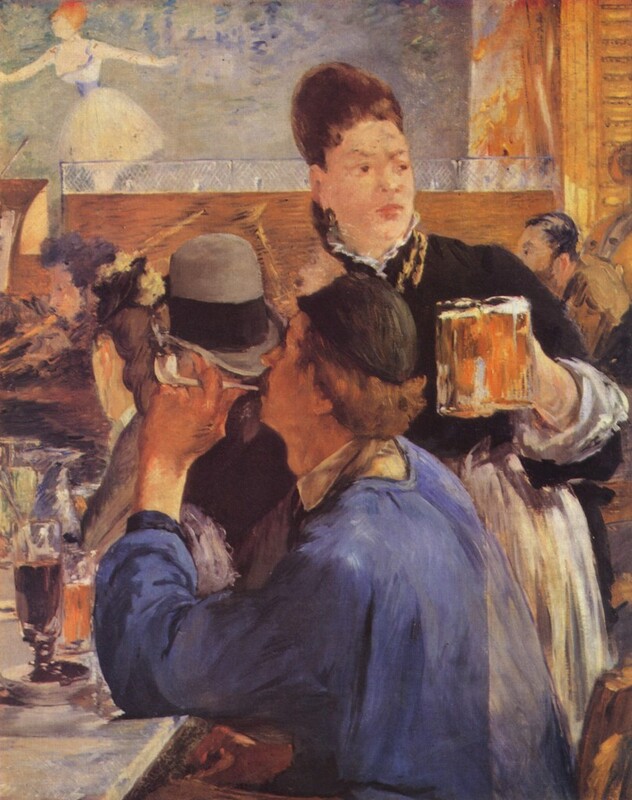 In Manet’s paintings such as the Serveuse de Bocks, the figures depicted often look at events that happen quite outside the space depicted. Such displacement makes more evident the artificial cutting of reality that any image makes. For this reason Foucault elected Manet as the first creator of images whose main theme is the material properties of images themselves. With Manet, the idea of images as illusionistic constructs is replaced by the idea that any picture is a material object with its own peculiar material properties. In different ways both Bataille and Foucault see in Manet’s work the possibility of liberating the image from its representational aura towards its full affirmation as a material object. The critique of the theatrical aura of painting is further developed by the formalist criticism of Michael Fried. Unlike Bataille and Foucault, though, Fried did not focus on the literality of painting, but on the way Manet developed a special awareness of the effects of painting on the beholder. For Fried, Manet is the first artist to be fully aware of the problematics of looking at a picture.7. Ibid., 50. 8. Fried, Manet’s Modernism, 18. As is well known, the relationship between the artwork and its beholder has been the central focus of Fried’s criticism. For him, a work of art must be finite in itself and not dependant on the viewer’s subjective response. The moment art depends on subjective response it becomes “theatre,” loses its integrity and interferes with the everyday experience of the beholder. As is also well known, Fried developed a critique of theatricality in his canonical essay “Art and Objecthood,” in which he attacked minimal art.9. Michael Fried, “Art and Objecthood,” in Artforum 5 (April 1967), 12-23. Reprinted in Michael Fried, Art and Objecthood (Chicago: The University of Chicago Press, 1998), 148-172. In this essay, he argued that the literalness of work by artists such as Donald Judd and Robert Morris implied that a work of art is always incomplete and requires the direct engagement of the viewer—and her capacity to move around the artwork—to be fully realized. In this way the boundary between art and what is not necessarily art is blurred in a situation that resembles our normal everyday condition. As Fried argues, “we are all literalists most of our lives.”10. Ibid., 168. For this reason Fried called for an art that was radically complete without the need to engage the active participation of the viewer. For Fried such art included, for example, the paintings by Morris Louis and Kenneth Noland, or the sculptures by Anthony Caro, in which what was expressed were the relationships within the work itself. For example, in paintings by Louis, the relationship between the rivulets or strips of colour and the rectangular blank canvas is so strong and complete that it presupposes an arrested, “transfixed” beholder in front of them. On the contrary, minimalist artworks are experienced through a situation of radical indeterminacy with respect to subjective response. This means that the intentions of the artists are no longer recognizable since they become confused with the subject’s experience of the artwork itself. It while thus preoccupied that Fried rediscovered Diderot’s critique of theatricality in painting.11. Michael Fried, Absorption and Theatricality: Painting and Beholder in the Age of Diderot (Chicago: University of Chicago Press, 1998). For Diderot, paintings were produced in order to be seen and this condition resulted in the excessive rhetorical play of the figures and scenes depicted. Diderot called for a painting style liberated from this primordial convention, as what was depicted would exist without a beholder in front of it. Fried recognized a Diderotian approach in the paintings of Chardin, such as Young Student Drawing, in which the French painter portrays a man seen from the back completely absorbed in the activity of drawing. Fried defined this condition of the subject as “absorption,” as opposed to the theatricality of more traditional painting in which everything is active in order to entertain the beholder. However, this interpretation of an anti-theatrical art came to a crisis the moment Fried was confronted with the work of Manet. Unlike the absorbed figures of Chardin’s pictures, in Manet’s paintings, the figures often address the beholder in an almost aggressive way. This is evident in famous pictures such as Le déjeuner sur l’herbe and Olympia. According to Fried, in these paintings the condition of beholding a picture is directly registered into the painting itself and thus the actual beholder is placed in an unprecedented position. Even though Manet is a theatrical painter in the Diderotian sense of the term, the radical frontal approach of his compositions—what Fried called the condition of “facingness”—makes evident the primordial convention that a picture must be beheld with a new force and explicitness. For Fried, such ostensible theatricality becomes a profound critique of theatricality, because by making it so explicitly evident, the painter reinforces the distance and thus the confrontation between the image and the beholder, who is then made aware of the constructedness of the picture itself. Recently, Fried has rediscovered such an approach in contemporary photography, especially the work of the photographers affiliated with the so-called Dusseldorf School, such as Andreas Gursky, Candida Höfer, and Thomas Struth.12. Michael Fried, Why Photography Matters As Art As Never Before (New Haven, London: Yale University Press, 2008). In their work, the image is clearly constructed in order to be beheld. And yet it is precisely this factor that makes these photographs non-illusionistic depictions of reality. For example, as Fried has argued, Gursky’s images are spectacularly open to visual inspection because of their wealth of details, yet they rebut any possibility of representing a particular point of view that could be taken by someone in front of the photograph. For Fried, such a condition of radical facingness produces a “severing” effect between the photograph and the viewer. By reading the paintings of Manet and the work of these contemporary photographers, Fried seems to suggest the possibility that images can be radically themselves by emphazising their condition of being beheld. By making clear that the image is made in order to be seen, the producer of the image destroys the aura of the picture, which is its illusionistic status, its claim to offer a privileged “view” on reality. Above all, the severing of images from the viewer attacks one of the most crucial powers of images: inviting the viewer to interact with them by identifying her real experience of space with what is depicted in the image. Such interaction and identification between picture and viewer, subject and object, is today a fundamental characteristic of the productive and re-productive apparatuses of the post-Fordist economy in which subjects are governed by making them active participants in the spectacular production of their own experience. The work of Manet and the critical discourse that it originated suggests a radical alternative to the contemporary regime of image production, as well as the production of architecture. This radical alternative consists in assuming that images are finite constructs, material objects with their own material properties. The radical lesson of Manet’s images is that they are not mere fragments of the world; rather, they are objects in themselves that not despite, but because, they accept and even exalt their condition of being beheld, confront beholders as something separated, severed away from them. 1) Nicholas Bourriaud, Relational Aesthetics (Paris: Le Press du Reel, 1998). 2) See especially Christian Marazzi, Capital and Affects (Los Angeles: Semiotext(e), 2010). 3) Michael Fried, Manet’s Modernism, or, The Face of Painting in the 1860s (Chicago: University of Chicago Press, 1998), 25. 4) Georges Bataille, Manet (Geneva: Skira, 1955). 5) Carole Talon-Hugon, “Manet o lo smarrimento dello spettatore”, in Michel Foucault, La pittura di Manet, edited by Maryvonne Saison, trans. Simona Paolini (Milan: Abscondita, 2005), 75. 6) Michel Foucault, Manet and the Object of Painting (London: Tate, 2011), 15. 8) Fried, Manet’s Modernism, 18. 9) Michael Fried, “Art and Objecthood,” in Artforum 5 (April 1967), 12-23. Reprinted in Michael Fried, Art and Objecthood (Chicago: The University of Chicago Press, 1998), 148-172. 11) Michael Fried, Absorption and Theatricality: Painting and Beholder in the Age of Diderot (Chicago: University of Chicago Press, 1998). 12) Michael Fried, Why Photography Matters As Art As Never Before (New Haven, London: Yale University Press, 2008).